Presley did not have a clear idea of what type of work she wanted to do. She came to Goodwill for a community-based assessment to help her identify jobs that would match her abilities and interests. 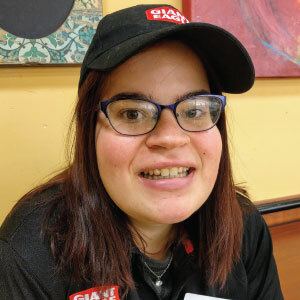 Working with her vocational evaluator, Presley tried out food preparation tasks at Giant Eagle. She realized she not only enjoyed the work but was also good at it. In fact she was so good, the store staff who supervised her experience encouraged her to apply for a job! Presley applied, and was quickly hired as a member of the prepared food team, where she makes sandwiches and fills customers’ orders. Click here to learn more about Goodwill's Assessment Services.